So the big news in my life this week is this: GARETH AND I ARE ENGAGED! 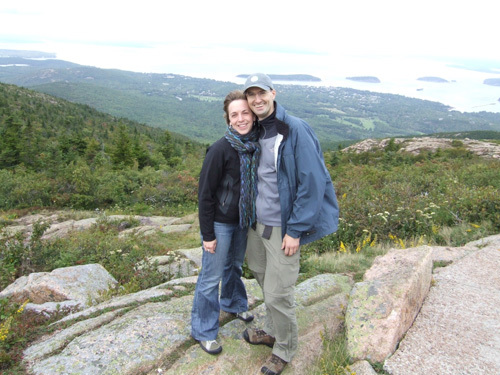 He popped the question last Friday when we were at the top of Cadillac Mountain in Maine’s Acadia National Park, taking me completely by surprise. There is presently is no fancy ring on my finger but rather a twist-tie in the shape of a ring, which was delivered to me in an actual ring box. Gareth gave me the twist-tie as a temporary substitute, figuring I should have the pleasure of choosing my own ring, but there’s a sentimental reason for it too: A year or so ago we were listening to a friend relay the story of a penniless pal of hers who was engaged to a woman demanding a very expensive engagement ring. I was appalled by my friend’s description of this woman’s demands and remarked that I thought her attitude was ridiculous. 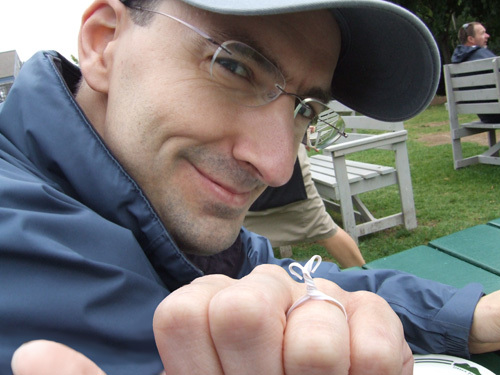 "If you truly love someone," I said, "they could give you a freakin’ twist-tie for a ring and that would be enough!!" Let it never be said that my (now) fiancé doesn’t listen to the things I say…! I can’t imagine a more fitting or beautiful sentiment for this occasion. This entry was posted in Uncategorized on September 18, 2008 by Alison Morris. 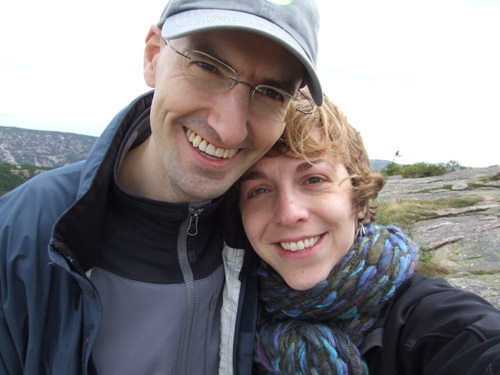 I just stumbled on your blog today–and what a lovely first entry to read! The Shaun Tan quote is perfect. Here’s to your continuing adventures together, may they be filled with joy. I love that Gareth has an enormous goofy grin in all of these pictures, as is entirely appropriate. For saving money and generally simplifying the planning, Cliff and I found that getting married in January worked wonders- there are weather risks, true, but you have your choice of places and wedding elves, who will typically do things less expensively and less harriedly than in June. Or we will all just come up to your house singing and dancing and holding ribbons and dance you off to be married. Just tell us when. That’s the exact place that my husband proposed a few years ago!! We are very happily married and expecting our first child soon, so I like to think that it is an auspicious location to begin this part of your life together. 🙂 Congratulations!! Gareth sounds a lovely man – and thank you for adding good connotations to twist-ties! Many, many congratulations! A twistie tie – I love that. Has any writer ever used it in a romance novel; if not, somebody should. Congrats! Congratulations! I got goosebumps at “The Red Tree” part… My brother and his wife had a tiny morning wedding in the courtyard of an art school and served brunchy food and mimosas- very inexpensive (I think he said the whole cost of the wedding was under $1000!) but the sweetest wedding I’ve ever attended! Congratulations again! Hooray for you both! Congrats! I had a twist tie engagement ring too! How fun! Congratulations! I love the heart at the top of the twist-tie ring, and I totally love Shaun Tan’s The Red Tree. Your wedded life is off to an auspicious start! Add me to the group of women who teared up while reading your story. Wow, you’ve found a true romantic. I’m very happy for both of you. Thanks for sharing the tale. Congratulations! What an amazing story with loads of meaning behind it. Using The Red Tree is very swoon-worthy. HUGE congratulations! And all these pictures are *gorgeous*! My one piece of wedding advice: Invite only the people who are really special to you; that way, at the end of the day, you will feel like every moment has been worth it as opposed to wasting the day on chitchat with people that don’t nearly matter as much. Oh, and enjoy everything! Whee!! I was thought about the two of you a few weeks ago, thinking, “I hope they get married. They are so good together!” And now! Whee, again! Omigosh I’m so happy for you! Yay, Alison! Every time you mentioned Gareth in the blog, I always wondered when it was going to happen and whether you would post it. Congratulations and all the best. P.S. Forget diamonds-I think that twist ties are a girl’s new best friend. Tell Gareth to be careful- such a cute, sentimental idea might send Tiffany’s out of business! Love will find a way. Thank you for the happy story. For wedding favors, my daughter had a Candy Bar. A round table held a variety of old fashioned penny candy and small party bags. People could just help themselves. I had a single large dried hydrangea (still beautiful color) as my wedding bouquet. Your pictures are beautiful, you look like a million dollars. What an amazing engagement story! Congratulations! I was recently married in a historic library in St. Paul, MN and to save money on centerpieces we gathered our favorite books with “love” or “marriage” in the title, stacked them opening certain books to a specific page, tied them together using beautiful ribbon, and placed a single rose in the bow. Our guests loved it and they were able to take the books home as favors at the end of the night! Best of luck for a wonderful life together! Congratulations! That’s such a beautiful story that I’m tearing up a little. My best wishes to the both of you as you start your life together. Wow! I love hearing all of your stories and getting all this great advice – keep it coming! Suekush, to answer your question, Gareth (whose full name is Gareth Hinds) is an illustrator, best known for his graphic novels. His most recent titles include adaptations of Beowulf, King Lear, and The Merchant of Venice. You can see them on his website: garethhinds.com. I’m coming out of lurk-dom for this! What a beautiful story…and a beautiful start to your life together! Felicitations! Money-saving suggestion: if you want a biggish (but not too big!) party, ignore the Boston hotels and look at the Hawthorne Hotel in Salem. Congratulations! As a good friend of mine says (a little too often), I love Love! My now-husband proposed without a ring (which I LOVED) but presented me with a simple infinity band the next day. We were able to then take the time to create the wedding rings ourselves. My ring has gold from his mother, grandmother and other relatives all melted into mine. His ring holds a link from my parents’ 25th wedding anniversary bracelet. Oh! And create a wedding page on Ning.com! It saves you money on Save The Dates, etc. Congrats! Congrats! 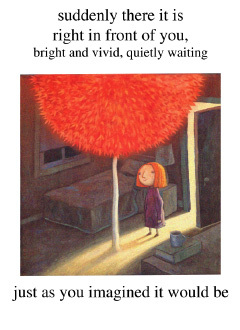 The image and text from The Red Tree made me cry—too sweet! I’m remarried to a wonderful man who bought me a sapphire engagement ring to represent the birthstone of both my daughters, a symbol that he was marrying into our family. It also has two tiny diamonds for the two of us. Alison, what lovely happy pictures. The twist tie and sentiment, those views of ocean and mountains, most romantic. The listening: priceless, as they say. Being starving artist types when my husband and I got engaged, we skipped the engagement ring, but just decided to go for it for our twenty-fifth anniversary. At least it’s still shiny! But I totally agree: it’s not the ring that makes things work. Congratulations! The twist-tie ring is a good sign. My seventeen-year marriage started with a dollar bill folded into a ring. Just wondering: what kind of work does your fiance do? I’ve noticed a disproportionate number of literary people marry science people. Also: try shopping for a diamond at the Jeweler’s Building on Washington St. (Downtown Crossing). Real diamond merchants, less mark-up than retail stores.